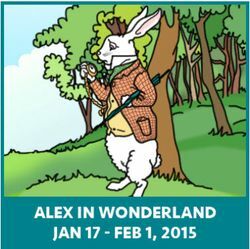 Alex in Wonderland at Toronto’s Solar Stage Children’s Theatre is full of colourful characters that are sure to please the kindergarten set. Its adaptation by Derek Genova includes a good dose of audience participation, too. The play begins with Alex’s long fall into the rabbit hole, vividly evoked using shadow puppets. It was a captivating downward journey that made the young audience go quiet as we listened to Alex’s narration and slightly scary sound effects. I think the kids thought the puppets were just plain cool, as we saw Alex drop down and meet objects and other characters along the way. For me, the play got even more entertaining once the puppets were put to rest. Alex (big-eyed Sara Jackson) was desperate to find the hurried White Rabbit (Eric Benson). The Rabbit made great use of the space as he ran through the aisles, pocket watch in hand, while the kids went nuts. There he is! Tiny fingers were pointed and little voices were shouting in an attempt to help Alex locate the long-eared sprinter. Speaking of the space itself, the seating was cozy. Close to the stage were large steps lined with cushions of different sizes. Kids and flexible parents could sit on them. Being on the floor on these cushions got uncomfortable after a while, but I did enjoy the circle-time ambiance. At the back were proper chairs. My little friend liked the Caterpillar (Devin Upham) best because of his multiple moving arms. The Caterpillar had a clever get-up indeed: a cute green costume that required four arms, making it a two-actor costume. However, the look that I found most striking was the all-red gown on the Queen of Hearts (Jillian Welsh). It made her even creepier as she repeated “Off with his head!” during the trial scene. While the program indicates that Alex in Wonderland is for children aged 4 and over, I think it was more of an under-7 event. Proof? Twinkle, Twinkle was belted out, and references to Dora the Explorer and Thomas the Tank Engine were met with nods and giggles. The only thing I didn’t like about Alex in Wonderland is that latecomers were allowed in. The entrance is beside the stage, so every tardy person had to cross in front of half the stage to get to the aisle in the middle. It was distracting. Lastly, I think someone at Solar Stage Children’s Theatre has a good head for business: they host birthday parties, they hold raffles, they sell water bottles for a dollar. Above all, they sell posters of Alex in Wonderland for $2 each (worth it! ), and the kids get them signed by each of the four actors after the performance. The line was long! The kids were thrilled to say hello to the smiling, talented cast. Shows run January 24, 25 and 31 and February 1 at 11 a.m. and 2 p.m.
Tickets cost $16 for each person, including babes in arms.